Summer weather means that all across America people are perking up at the jingle of the ice cream truck and getting ready to cool down with popsicles, ice cream, and other frozen goodies. Sure, Chipwiches and Choco Tacos might be delicious, but they just can’t compare to many of the amazing icy delicacies that are popular internationally. Be prepared for some serious dessert envy. 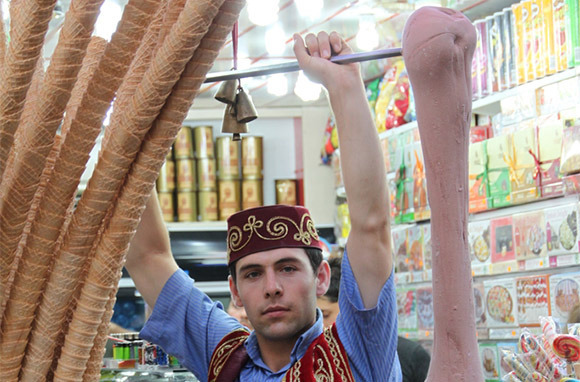 Head to Istanbul or most anywhere in Turkey, and you'll be tempted by the showman-like vendors selling Dondurma (a special kind of ice cream). Dondurma peddlers use long wooden paddles to churn the dessert, putting on an elaborate display as they dole out scoops. This isn't any kind of ice cream—Dondurma is made from milk, sugar, salep (a type of flour) and mastic (a resin that gives it a chewy texture). It also melts much slower than regular ice cream, so go ahead and order that cone even on the hottest of days without worrying about drips. Faloodeh may look like a noodle soup, but you'll get a sweet surprise when you slurp up a cold, sweet spoonful. Faloodeh is found in Iran and is made with vermicelli noodles semi-frozen with rose water, lime juice, and sugar. 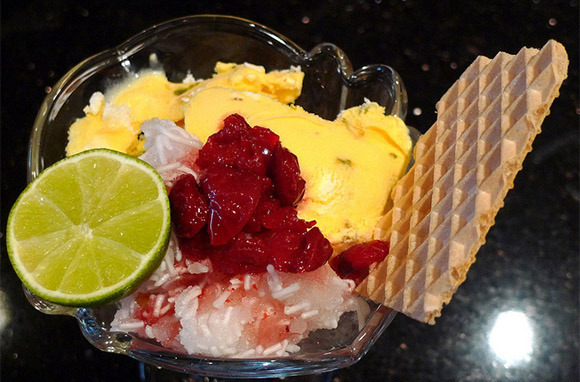 Commonly consumed in central Chile, jam is used to flavor shaved ice instead of fruit juice (hence the name, meaning "ice with jam"). 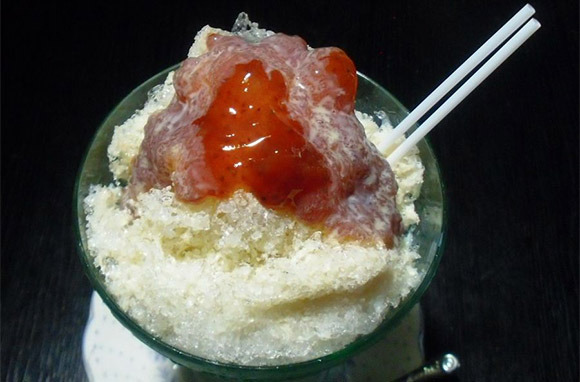 Combine shaved ice with corn kernels, sugar, and milk, and you've got a unique savory/sweet treat, found throughout the Philippines. 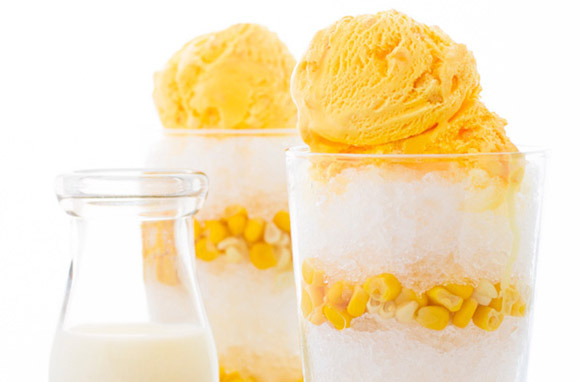 The name in Filipino translates to, "corn with ice." 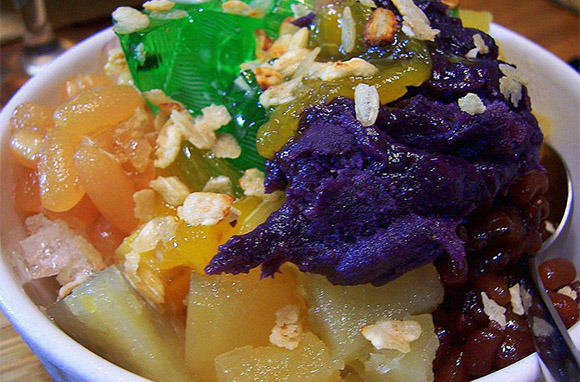 You can pretend that halo-halo, a Filipino creation, is healthy thanks to its mega dose of protein (boiled kidney beans and garbanzos make up a large part of this dish), but keep eating the concoction of shaved ice, evaporated milk, Jell-O, sugar-soaked fruits, and cheese (all topped with sprinkled sugar and either leche flan, purple yam, or ice cream) and your waistline will soon confirm this icy treat's place firmly on the dessert menu. Have you been restricting your ice cream sandwiches to cookies all of this time? Then your taste buds are missing out! 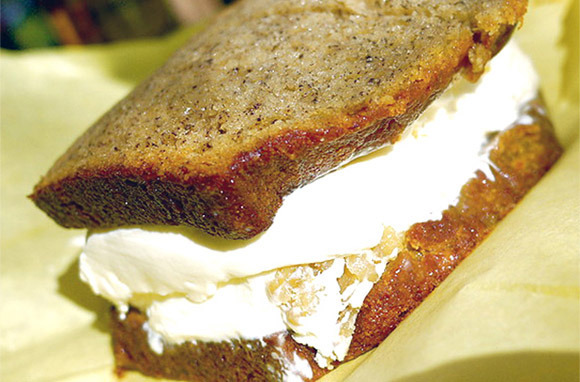 In Japan, you can get a banana bread ice cream sandwich—two pieces of banana bread surround vanilla ice cream topped with a banana sauce. That's a whole lot of banana. 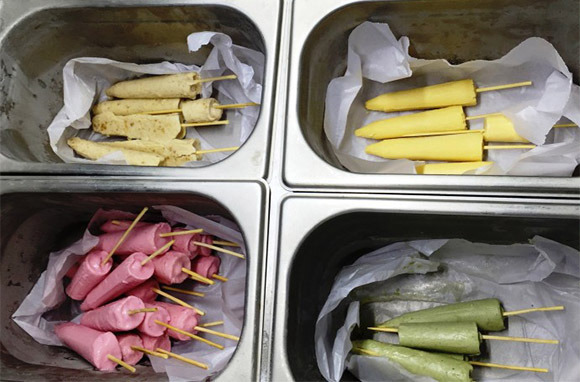 Whether it's served up on a stick or a plate, you'll find kulfi on every street corner in India. Although it looks like an ice cream pop, it tastes even creamier and denser than gelato thanks to its rich ingredients and lengthy preparation process. (Kulfi is made by slow cooking sweetened and flavored milk.) Plus, you're more likely to find flavors like rose, mango, cardamom, or pistachio than chocolate or vanilla. Sure, everyone's probably heard of and sampled gelato by now, but have you upped your decadence game by trying a brioche con gelato? 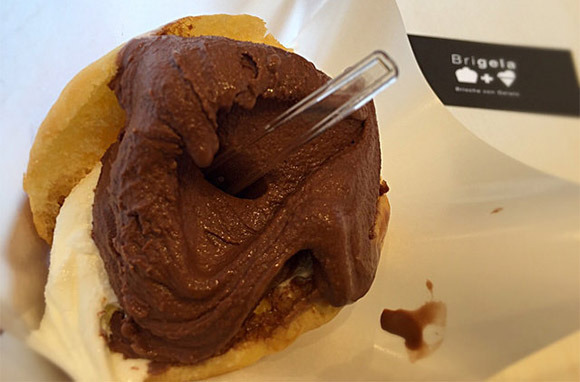 It's Italy's answer to the ice cream sandwich, and it involves stuffing a brioche bun with ice cream. It's like a portable, somewhat savory ice cream cake that you can eat like a hamburger, and we need one now. 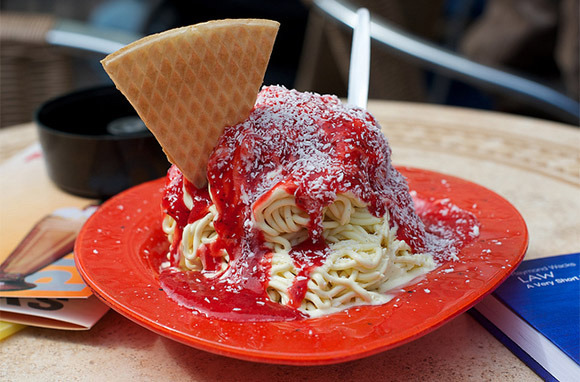 Confuse your brain and your stomach with this dish that looks like spaghetti but is made from ice cream. Invented in Germany, spaghettieis is made from vanilla ice cream pressed through a potato ricer to look like noodles. The "noodles" are then topped with strawberry sauce that looks like tomato-sauce, and sprinkled with "parmesan cheese" (actually made from coconut flakes or shaved white chocolate). Since it looks like spaghetti, can we have this for dinner? Best Foreign Fast-Food Chains We Want in the U.S.